Odd as it seems, I don’t think I’ve ever really understood YouTube. Actually, let me rephrase that: I’ve never really understood the YouTube community. Sure, I can hit play on an embedded Thor 2 trailer, hover my mouse over the bottom-right corner until the ‘skip ad’ button appears, and turn off ‘annotations’ as well as the next guy, but I’m clueless when it comes to navigating the site itself. When I load up the homepages of Facebook, Twitter, Reddit et al., I can easily identify the newest content, and spot the ways in which it’s been personalised to me. When I load up YouTube, I’m presented with a Flo Rida video, a Mark Wahlberg trailer and something called ‘Neville owns Carragher’. I find the individual channels even more mystifying — bizarre realms full of indiscriminate jump-cutting and haircuts I thought died out with nu metal. So perhaps I should have expected something of a culture shock when I accepted an invitation to appear on a ‘YouTube Pro Series’ panel at the YouTube ‘Space’ in Central London. 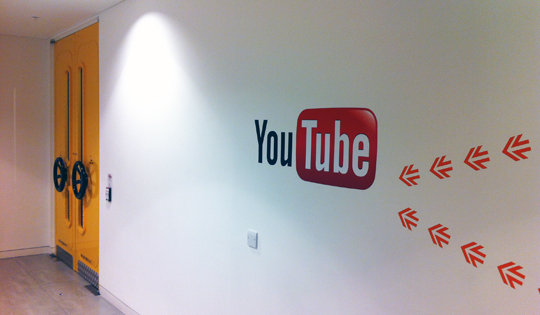 Parent company Google have bought three such Spaces around the world, each one a self-contained film studio freely accessible to any YouTube ‘creator’ with more than 10,000 channel subscribers. The London branch is located at the £450 million Central St. Giles complex near Covent Garden, in the same building occupied by both Google and Universal. It’s the kind of place where the lifts don’t have buttons and there’s a Peyton & Byrne at reception. When I finally found my way up to the Space (it turns out you have to ‘hail’ your lift from a control pad at the end of the corridor) I was greeted by the sight of an immense set of yellow doors, each adorned with one of those big nautical airlock wheel things in place of a handle. Above each wheel was inscribed ‘do not turn’. There’s an analogy to be made about this uneasy meeting of childlike whimsy and corporate ordinance, but I’ll get to that later. Inside, I was welcomed into a large ‘shabby chic’ green room filled with expensive-looking upcycled furniture. There I met my fellow panellists, as well as a sort of latter-day Johnny Borrell figure (only much friendlier) whose name I forget. He, it transpired, was one of the creators, and he spoke with great enthusiasm about the Space, which he saw as a sort of 21st Century answer to Andy Warhol’s Factory, sprawling with hip young gunslingers who just happen to favour Metro Station over The Velvet Underground and free Red Bull over free love. As YouTube employees came by to introduce themselves, each asked him what he was doing in the green room. He laughed the question off. They tousled his hair in jocular approval. He was, after all, the creator. Gazing out into the crowd, I realised with a start that I recognised almost every audience member. Not by name, but by face, and haircut. They were the bedroom-dwelling jump-cutters, the elaborately styled LOL-merchants I’d so often strayed across while looking for leaked Lady Gaga singles and Photoshop tutorials. Even charlieissocoollike, the internet’s third favourite Charlie after Charlie Bit Me and Charlie the Unicorn, was in attendance. If the Borrell-alike had merited respect, this guy warranted nothing short of veneration. I was immediately out of my depth. The rest of the panel spoke in terminology I could barely understand. They made reference to immensely popular YouTube shows that I’d never even heard of. At one point, they joined together for a singalong of what I can only assume is the theme tune to some acclaimed online drama serial — a Mad Men for the ‘so random’ set. Was I really so out of touch? A little way into the panel I mentioned my Snapchat account in an attempt to claw back some street cred. The audience looked at me like most people look at David Cameron when he talks about The Smiths. Of course, it seems unlikely that one of the world’s largest multinational corporations would run an enterprise like this out of the goodness of its heart. The foremost priorities of YouTube — and by extension, the YouTube Space — are unquestionably creativity and profit, but which one takes precedence is a question whose answer appears to be in constant flux. If the Space is indeed run at a loss, then it’s presumably with the hope that the longterm profits brought in by people like charlieissocoollike will eventually outweigh the initial outlay. Maybe I was subconsciously on the lookout for them, but signifiers of this awkward dichotomy seemed to be all around — and I’m not just talking about the fake door handles. In one room I inexplicably found a huge metallic banner for the MOBOs, another organisation that has struggled to reconcile its creative and commercial interests. Even the repeated enquiry as to how many subscribers I had seemed motivated both by curiosity and suspicion, as though a wrong answer might lead to my ejection from the building. Luckily I was long out the door before they had a chance to look up the answer: 216.